Posted by Rita on August 25, 2014, updated August 25, 2014. Orlando, Florida, “The City Beautiful,” also known as “The Theme Park Capital of the World.” With such a focus on our tourist and service industry here, it is easy to lose sight of the beautiful side of our city. Sometimes it takes some searching, a little bit of effort on our part, but if we stop to look around a little we can be reminded of just how beguiling our little piece of Central Florida is. If you’re finding yourself stuck and uninspired, we’d like to take a moment to share some of our favorite places we find inspirational around town. We’ll begin right in the heart of Orlando. 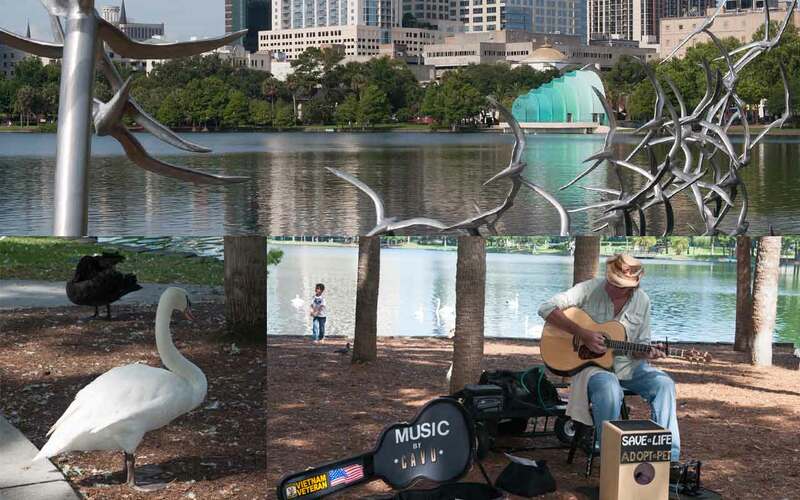 Lake Eola is more than the nucleus of our urban city center. It is the pulse, the beat, the cadence of the city’s essence. The city begins here and extends it’s many arms out to give energy to its residents. 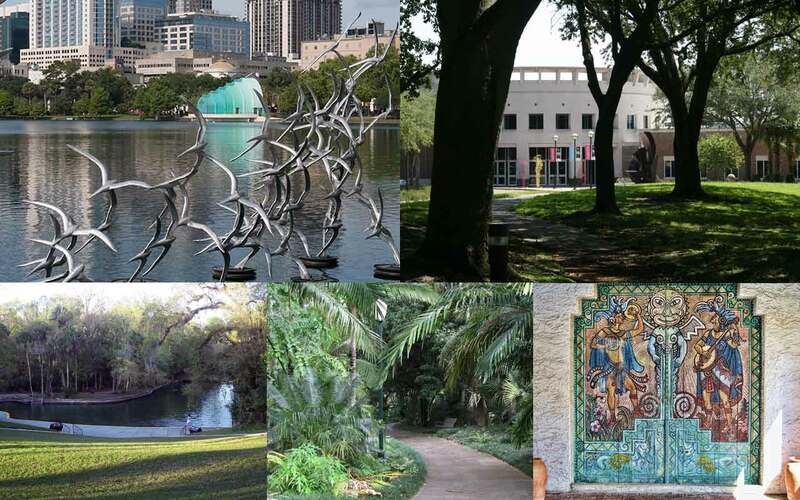 It is impossible to visit this downtown respite without understanding why we call Orlando, “The City Beautiful.” The expansive body of the lake gleams under the Florida sun, catching its rays and reflecting them back to the life blossoming around its banks. It is the perfect blend of the urban skyline backdrop with the organic nature of the park. To stand in any one spot and look out across the water is to see the city at its most beautiful. Underneath the booming activity of the Farmer’s Market on Sundays, of the children climbing the playground, and the runners winding their way through it all, there is a history rife with legend and intrigue. The legend states that the city was named after Orlando Reeves, a soldier who died in 1835 during the Second Seminole War. It is said that where his body was laid to rest there was a marker with the words, “Here Lies Orlando,” and therefore travelers began to reference this sign when passing through or settling in the area. But, military records show no such person. However, there was an Orlando Savage Rees, a cattle rancher from the same time. Rees may have participated in some activity during the Second Seminole War and is believed to have left a marker with his name on it that later was misread by settlers as “Reeves,” thus giving us the former version of the story. Regardless of who bore the namesake, in 1939 a memorial was raised at Lake Eola by the students of Orlando’s Cherokee Junior School to designate the spot where Orlando Reeves, or Rees, supposedly fell. Continue to journey around the lake and one will find numerous more sights to see including sculptural adornment, people practicing meditation and yoga, and of course the iconic swans and geese waddling on the sidewalks hoping to catch some food from generous passerby’s. Unfortunately, many Orlandoans and visitors carry around a common misconception of our city. Too often we hear people say, “Orlando just doesn’t have any culture,” as if there is one pre-determined definition of what it means to possess “culture.” Regardless of what defines this “culture” we’re lacking, this is a gross misjudgment based on insufficient information. True, our more artistic cultural side is continually overshadowed by the theme park driven consumer culture, but that is not to say it doesn’t exist. 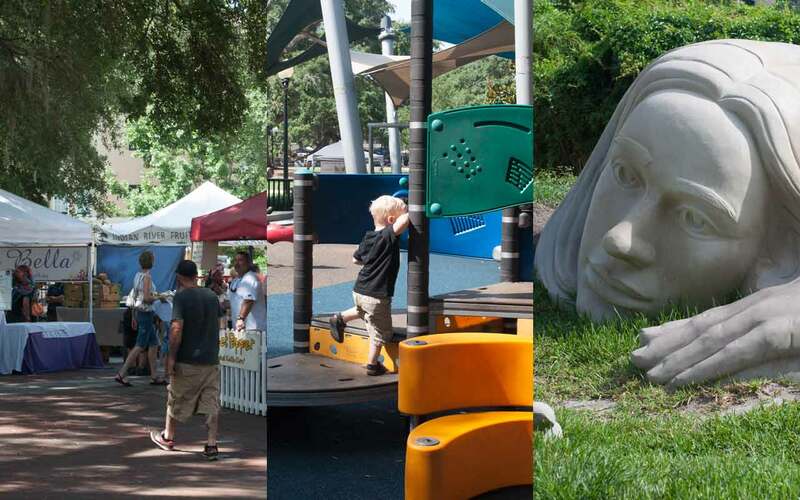 Loch Haven Park, just a stone’s throw away from Downtown, is a hub for artistically centered cultural events. 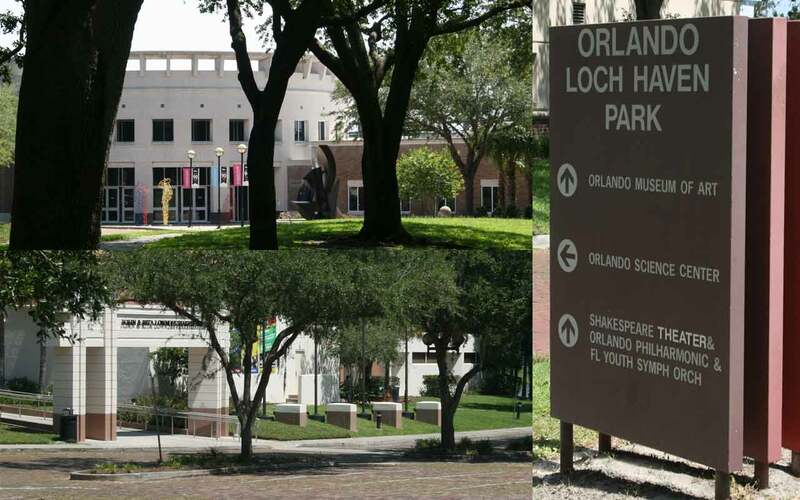 It is home to the Orlando Museum of Art, the Mennello Museum of American Art, the Orlando Philharmonic Orchestra, Orlando Repertory Theatre, Orlando Shakespeare Theater, Orlando Science Center, Orlando Fire Museum, and the Orlando Garden Club. Aside from the institutions, exhibits, and events offered, the grounds themselves provide a quiet and shady refuge from the traffic and noise of the city. Though technically in Maitland which is just a bit outside Orlando’s city limits, the Maitland Art Center is an architectural surprise. 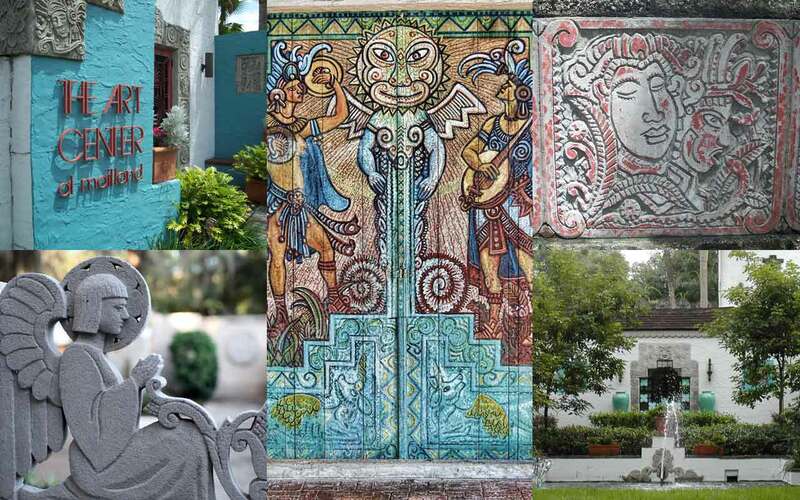 Nestled in amongst homes quintessentially old Florida, the building design is in the “Mayan Revival” style. Very few examples of this architectural style remain in the Southeast United States. To visit the museum is to step into another place and back in time. Suddenly visitors are transported down to Central America with it’s enigmatic and unique imagery. There’s a magic to the place, and a history just as fascinating as the decorations. The Maitland Art Center is what’s left of an artist’s commune, then named The Research Studio, began in the 1930’s by André Smith. Much like many other twentieth century inhabitants of our state, Smith was a snowbird seeking refuge from the bitter Northern winters who settled here and opened his studio’s doors for other Northern artists to join him. Today, this commune culture remains as the center continues to foster the careers of local artists. Florida, the Sunshine State, has over 30,000 lakes, 11,000 miles of rivers, and more than 900 freshwater springs. It goes without saying that Floridians clearly enjoy a lifestyle filled with sun and water. So, where do Orlandoans venture when looking for a little bit of of fun in the sun? A little bit of nature? A quieter, calmer outdoor retreat? Wekiwa Springs. 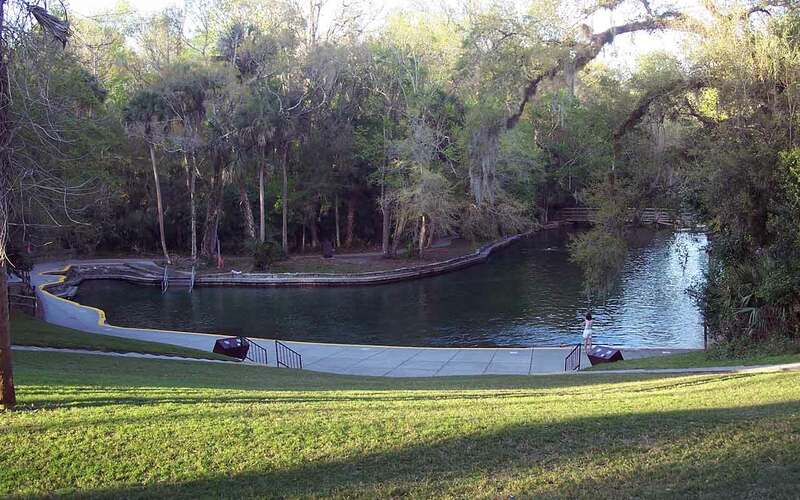 Located at the headwaters of the Wekiva River slightly northwest of Orlando, the springs offer the best of Florida outdoor activity frequented typically by locals only. Whether it’s to have a picnic, hike, kayak, horseback ride, or laze around in an inner tube and let the water take you where it will, one day at the springs and you’ll feel completely rejuvenated. 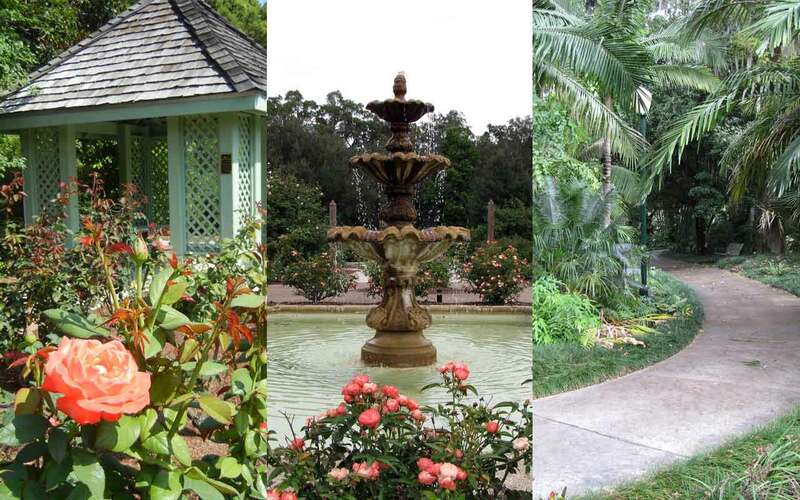 More commonly shortened to just Leu Gardens, this botanical haven is only a few minutes from Downtown Orlando. The gardens and turn-of-the-century home, now a museum, were donated to the City of Orlando in 1961 by Harry P. Leu and his wife Mary Jane. With fifty acres of tropical and semi-tropical gardens, visitors are able to experience and appreciate the Floridian flora. With the picturesque surroundings, it is no wonder the gardens are a popular venue for weddings and often serve as a backdrop for photo sessions. However, visitors to the grounds can enjoy far more than its beautiful scenery. Date-night movies in the park, “Jazz ‘n Blues” strolls, story time for babies and toddlers, horticulture classes, and a number of societies are just a few of the special events and offerings the gardens host for members of the community. Take one afternoon to stroll the sidewalks through the garden, snap a few pictures, and revel in the natural landscape. It’s the perfect environment for quieting the mind and smelling the roses. Posted by Rita on July 22, 2014, updated December 9, 2016.